Wood burning fire pits are the original fire pits but over the years, because people need home equipment and appliances that are easy to use, time saving and of course efficient, gas fire pits have quickly overtaken wood burning fire pits, and you can be sure that they will always be the popular choice for most consumers. Fire pits are primarily used for providing warmth and for just that reason alone, many people (me included) can simply not cope with the hassle that is present with wood burning fire pits from the trying to start a fire from scratch to the end cleaning process. So if you’re like me, an outdoor gas fire pit does come in handy for not only providing the much needed warmth during those evenings when you just want to chill out with friends and family and catch up, but also really does bring a nice cool ambience that is just unrivaled, as opposed to using say, an outdoor heater for instance. Below is a review of the “crème de la crème” of the Outdoor Gas Fire Pit industry. 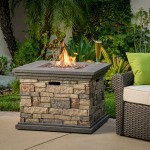 Extensive research has gone into making this list to make sure I create a list of not only what I consider to the the best Outdoor Gas Fire Pits but also, what other consumers think based on the customer reviews and popularity from giant online stores; Amazon, Wayfair, Home Depot and Walmart. 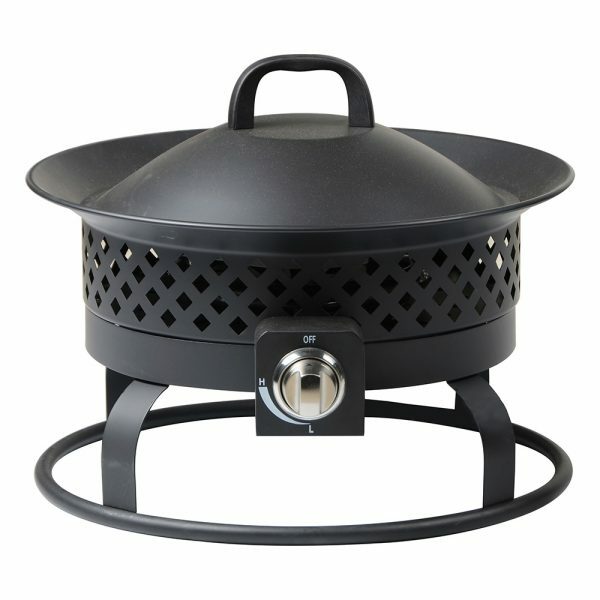 Now, the Heininger Portable Outdoor Gas Fire Pit is a best seller and has managed to maintain a high rating over the years which speaks volumes about its quality. 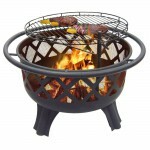 This fire pit is crafted from steel with a heat resistant coating to enhance its life span. It has an out put of 58,000 BTUs, which is sufficient enough to keep you warm during those outdoor gatherings. Comes with a 10 foot hose and decorative lava rocks to give the fire pit a realistic look and also enhance its visual appeal. 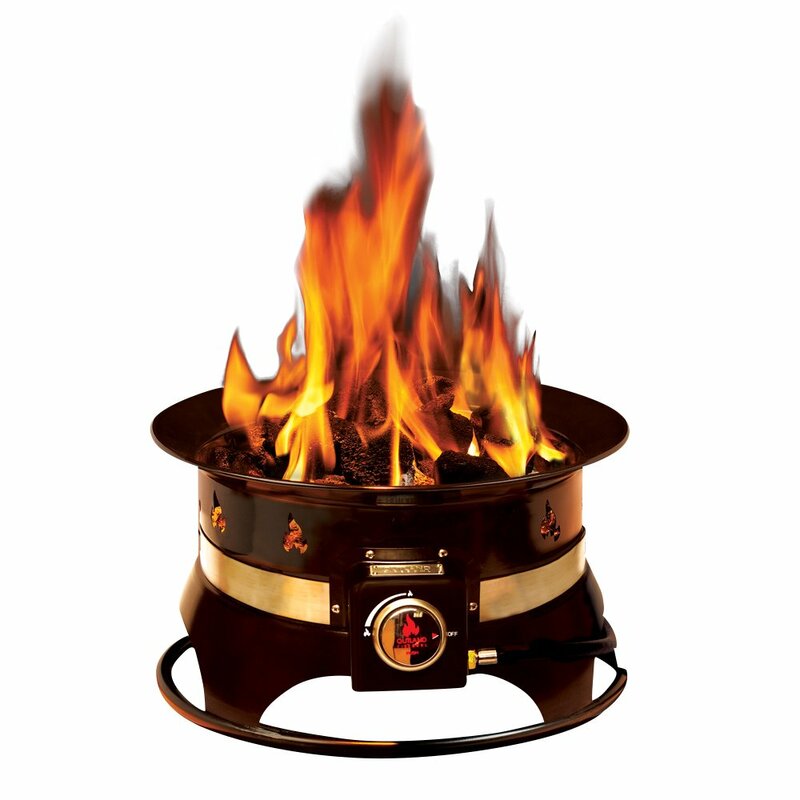 Steel frame construction with high temperature and rust resistant coating makes this fire pit durable and capable of withstanding the elements. It is light in weight and therefore easy to carry and move around the deck or backyard as you please. Popularly used for camping, backyards, patios, or tailgating on the go because of its compact size and light weight nature. Does not have a push button ignition for lighting. You need a match or lighter although it is easy to start. Does not come with protective storage weather cover. Does not really produce an abundance of heat according to some reviews, just enough heat for a small gathering. Nevertheless, with a BTU rating of 58,000 this gas fire pit is among the best rated in the market, plus it’s still selling better than gas fire pits with BTU a ratings of 60,000. The Outland Company with their range of outdoor gas fire pits is another popular fire pit brand, that has also maintained very high ratings over the years. They have 4 major, best selling propane gas fire pits; the Outland Mega Fire bowl Gas Fire Pit, The Deluxe Fire Pit, the Standard and Premium Gas Fire Pit. These 4 fire pits have almost the same features the only major difference being in size and of course, price. The Outland outdoor gas fire pits are all constructed from high quality steel with protective high temperature powder coating and enamel finish. Heat output of 58,000 BTUs, sufficient enough to keep a small group warm warmth. 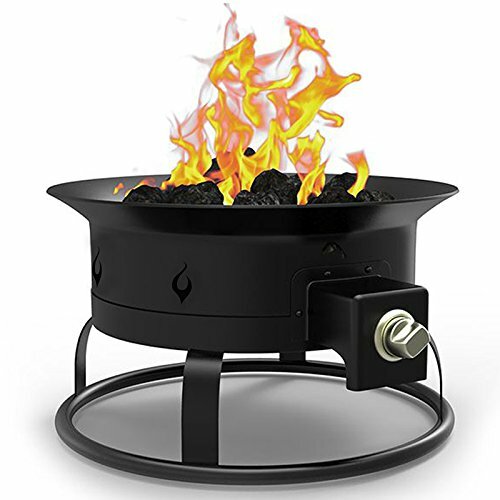 These gas fire pits do come complete with some useful accessories including carry strap, pre-attached 10 ft. hose with a regulator, a propane tank stabilizer ring, and decorative rocks for visual appeal and realistic flames. 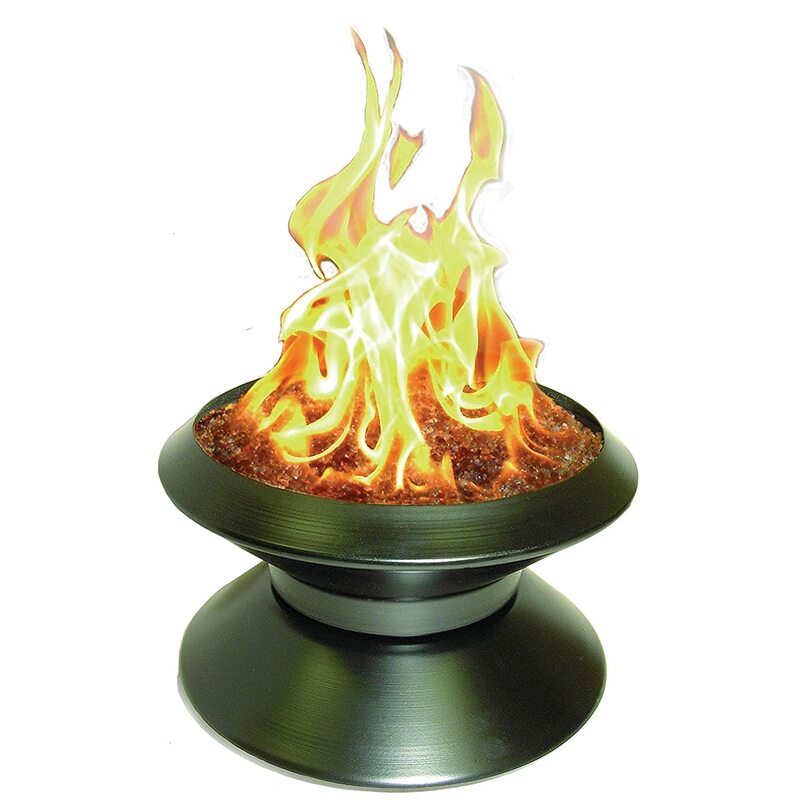 Mega-Second best seller and the largest, with a 24″ diameter thus a 75% larger surface area compared to the standard Outland fire pit. 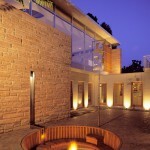 They are durable and quality gas fire pits. Can be converted to natural gas with the help of their CSA approved Natural Gas Conversion Kits that are available for purchase separately. 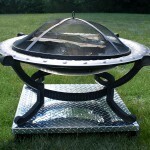 They are lightweight and portable most especially the the Standard Outland fire pit that weighs just 22 pounds. Ideal for rapid deployment for instant parties. No easy-to-use ignition meaning you need to use a match or lighter. You will not necessarily get flames as high as the ones shown in the pictures. 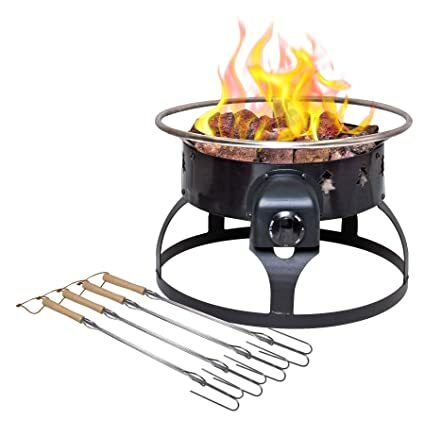 As at now, the Camco outdoor gas fire pit is the major competitor for the Heininger Portable Outdoor Gas Fire Pit on Amazon with at least 90% of the reviews being positive. They come in two sizes; the “Little Red Campfire” and “Big Red Campfire”. 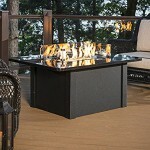 Crafted from durable steel and features an elevated fire tray. Very high BTU rating of 65,000 BTUs per hour. Includes a case for storage purposes, 8-foot propane hose with adjustable regulator and realistic log pieces for enhancing the appeal of your fire pit. 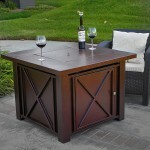 Also features a sturdy lid that easily latches on to base for safety and easy to movement. 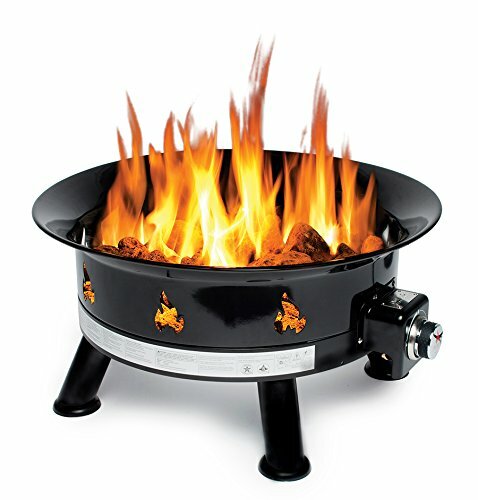 For big red campfire: 13.5 x 13.5 x 10.7 inches, 15 pounds. For little red campfire: 15.5 x 15.5 x 11.5 inches, 15 pounds. One of the highest heat output in the market of 65,000 BTUs. 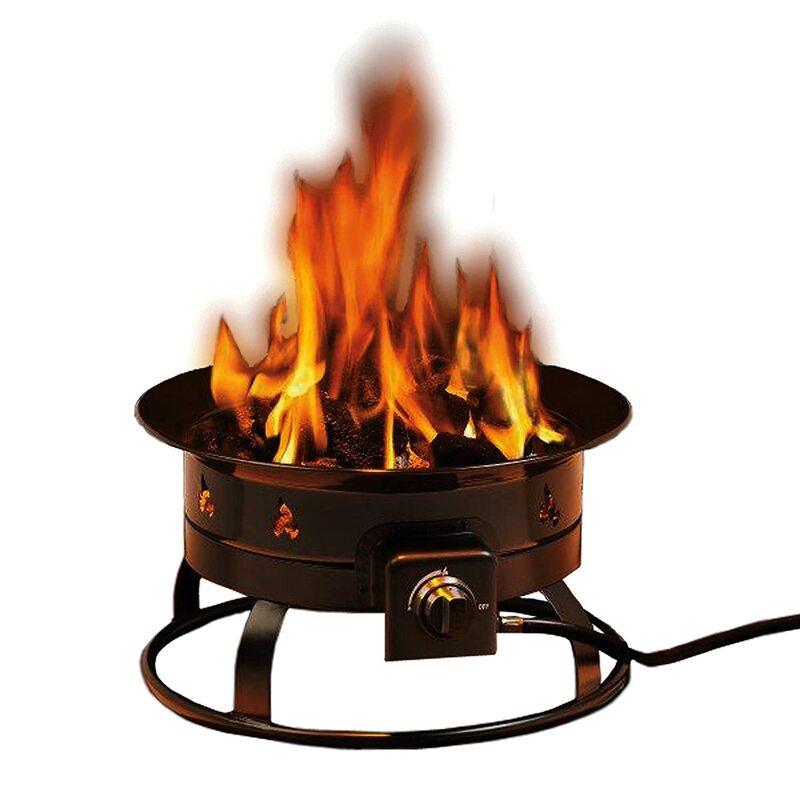 Can effortlessly be used for cooking with the help of a Campfire cook top that is sold separately. Ideal for outdoor camping and tailgating. Match or lighter is needed for igniting the fire pit. Made of heavy gauge steel with decorative pine tree cut outs on the frame and nickel coated steel safety rings for enhanced portability. Heat output of 55,000 BTU/Hr. Easy matchless ignition with fully adjustable flame-control dial for custom flames. Safety shutoff valve to prevent gas leakages and wastage. 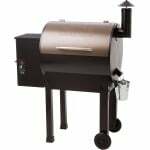 Comes complete with a set of 4 extendable roasting sticks, zipper carry bag, regulator and 5′ hose, a propane tank support stand and 12 lbs. of assorted lava rocks. 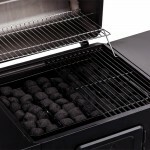 You can roast your marshmallows on this unit and they give you 4 adjustable roasting sticks for free to help with that. No fumbling with matches and lighters to light this unit up. Perfect for any outdoor gathering including camping and tailgating. Other than some models having issues with the control knob, there is pretty much nothing else to report here. It is crafted from solid steel. 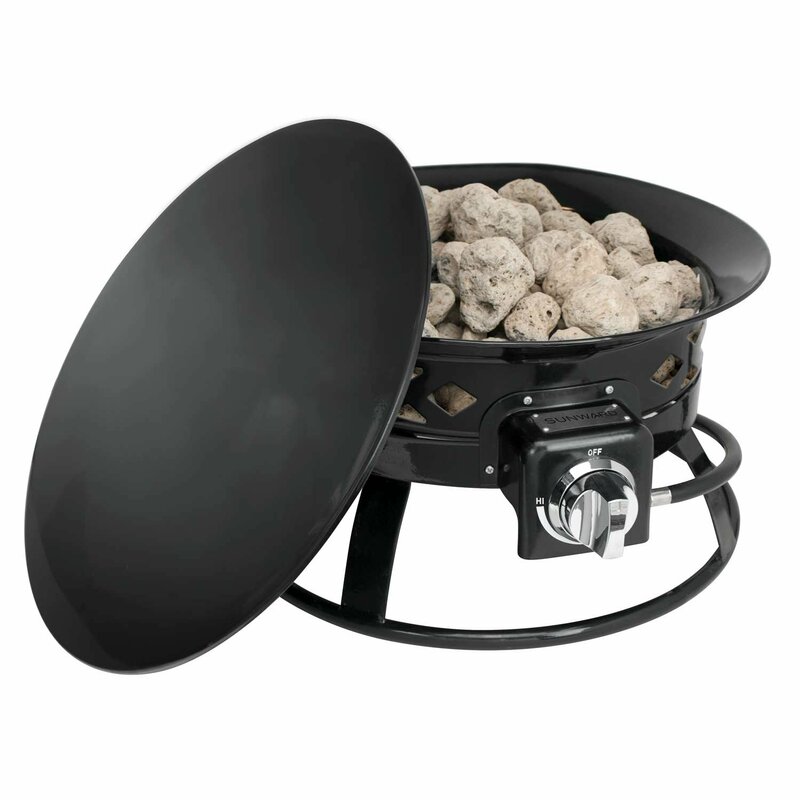 Includes all weather lid, long-stem lighter, asbestos-free vermiculite for filling for fire pit is and 10″ hose with regulator. You can roast marshmallows on this unit but as for roasting hot dogs, it’s not recommended as the grease will drip on the vermiculite granules which will be unsightly, effectively ruining the overall look of your fire pit. 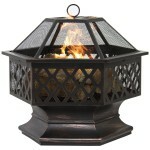 Don’t let the seemingly low BTU rating of this fire pit fool you because from the reviews, it seems that this outdoor gas fire pit puts out quite a bit of heat for its size, with some pretty robust and large flame, 10-12 inches tall. You can tell from the above picture that the fire pit is nice looking and can therefore perfect for accentuating your patio or any outdoor living space. Low BTU OF 40,000 but like we said earlier this fire pit can hold its own when it comes to heat production. Does not come with protective cover nor a carry kit. 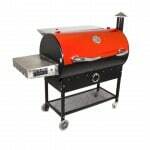 Features a stainless steel burner and a durable steel frame for long lasting durability. 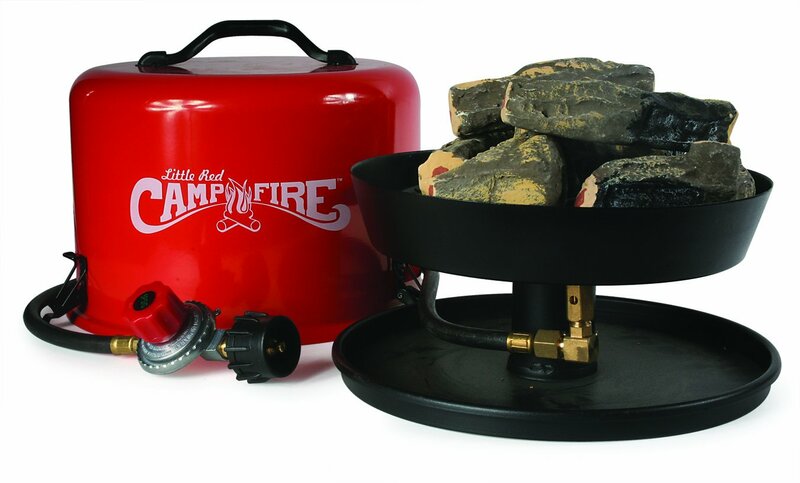 Includes a bowl lid, fabric strap with handle for carrying the fire pit easily, fire pit protective cover for storage, 10ft hose with regulator, propane tank stabilizer ring carrying handles and 4 bags of decorative lava stones. You can use for roasting hotdogs and marshmallows effortlessly. 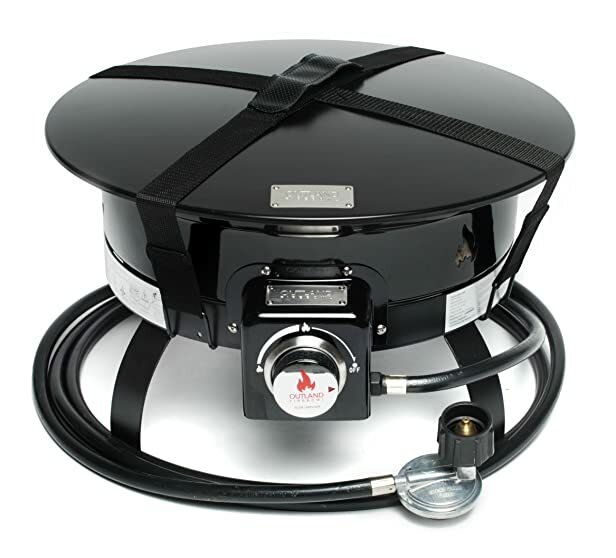 Comes with a lid, straps for easy carrying, 10ft gas hose with regulator, and LP propane tank stabilizer. Sturdy and solid fire pit. Roasting hotdogs and marshmallows is possible. Does not come with a weather cover. You need a match and lighter to power it. 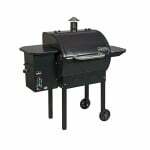 Features a durable sturdy steel construction. Easy to use electronic ignition with flame control knob for custom flame adjustments. Includes a locking lid with a solid carry handle to enhance its portability, pumice stones for aesthetics and real-looking flames, 10’ propane gas hose with regulator and a tank seat hideaway to conceal the propane tank. Comes with a no-fuss electric ignition knob for fast and easy light. Quite sturdy and durable and can withstand being used couple of times a week. Great for outdoor camping and tailgating. Lower BTU rating but nevertheless, is still does put out enough heat for a small gathering. One thing that you should know about a listed above fire pits is that they are CSA Certified or UL listed which means the design and manufacturing standards of the gas fire pit has undergone extensive testing by independent experts in order to be approved safe for use. 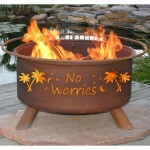 This means peace of mind for you as a consumer as you are assured of safety when handling the fire pit. 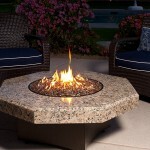 You want the convenience of a fire pit that is hassle free and easy to use, from start to finish. No fumbling with logs and matches just to start a simple fire. What you want is stress free cleaning with no messy ash residue to deal with after every fire pit session. You don’t want smoke chocking you and clinging to your clothes and body which to me is the most annoying things about using wood burning fire pits. You don’t want the risk of dangerous flying embers looming over you and ruining your fire pit experience. You want to be able to legally have a fire in camp grounds with bans against open flames. Any of these fire pits will allow you to have a fire in areas that have restrictions against open fires. You love camping, tailgating, RVing or any other outdoor party of the go. You just pack your fire pit with you and take it wherever. 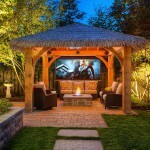 Want to create a place where friends and family can gather for outdoor entertainment. With just a few chairs and pillows, you can create a space with the perfect ambience for you and your loved ones to gather and catch up as you roast some hot dogs and marshmallows. If you need something to keep you warm outdoors or complement your other source of heat, such as heater, any of these fire pits would be a great for that. If your patio needs some face lifting or accenting, a fire pit would be a great addition and ideal for just that purpose. They may not be as nearly perfect for this purpose as fire pit tables, they still going to transform the overall look of your outdoor space. Do not forget, you can substitute the lava rocks, ceramic logs or vermiculite filler with fire glass for a much more appealing and elegant look. Just remember though, that there can be no roasting with fire glass as your fire pit filler option. Like it says on the title of this article, these fire pits are safe to use on a deck including a wooden deck or covered patio. I feel like I should mention, despite the fact that gas fire pits do not present the danger of flying embers I will advice you to please use a non-combustible material beneath your fire pit if your deck cannot withstand high temperatures and you value it. This is because, depending on the fire pit, the base usually gets very hot, hot enough to damage your deck or grass if there is no barrier to get between the fire pit base and your floor surface. Such things as concrete pavers or bricks will do the work of protecting your deck but you also have to make sure your fire pit is stable and not in the risk of tipping over. Even better, is using fire pit mats and deck protectors/grass shields specifically designed for just this purpose. They are 100% efficient and some are capable of withstanding temperatures as high as 1,500 degrees F. And worry not! They are durable and affordable too as with just less than $50, you can find a good one. Long story short, do yourself a favor and protect your grass or wooden surface from damage by a fire pit. Worth mentioning also is that for your gas fire pit to last for years, you must take measures to properly care and maintain it and that includes not leaving your fire pit exposed to the weather elements. If possible, always store your gas fire pit indoors or at the very least keep it under a covered patio when not in use. And because moisture can still get to it either way, always ensure it covered with a weather proof protective cover , indoors or outdoors when not in use. Some of the fire pits on this list come with one but should you buy one that doesn’t, it will be in your fire pit’s best interest and yours to invest in one. These gas fire pits are all portable so really there’s really no reason to expose them to unnecessary weather elements that will no doubt reduce the life of your fire pit. There can be no doubt that getting an Outdoor Gas Fire Pit is the way to go if ease of use and efficiency is your ultimate goal. The above list should help point you in right direction. Feel free to let me know id any of the fire pits meets your needs. 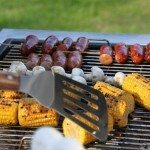 « Pellet Grills vs. Charcoal Grills: Which one is the Best?